Author, Sir Percy Fitzpatrick, wrote the book Jock and the Bushveld in Barberton. The sculpture of Jock stands outside the town hall. 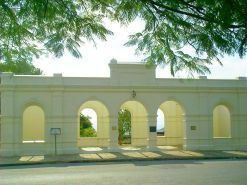 Barberton was home to the old Transvaal’s first stock exchange. The Barberton daisy was first discovered here by Robert Jameson in 1889. It might look unassuming, but the quaint Lowveld town of Barberton, in the foothills of the Makhonjwa Mountains, is a winner in the heritage stakes. Founded in the late 1800s, this town in Mpumalanga’s De Kaap Valley can lay claim to some of the country’s firsts: the first stock exchange in the old Transvaal; the first double-storey building in that province; the first swimming pool in the old Transvaal; and the longest and only cable car that crossed into another country (Swaziland). Barberton is a geological, cultural, ecological and botanical treasure trove well known for its gold-mining history. Fringed by the oldest mountains in the world, which date back 3.5 billion years, the town – some 43km south of Nelspruit – is home to some of the oldest exposed rocks on the planet. Barberton Community Tourism marketing manager Astrid Christianson says thousands of scientific papers have been written about the Barberton Greenstone Belt, or the Barberton Mountain Land, which has the best preserved and most easily accessed Archean rocks in the world. Most recently, microscopic fossils of primitive single-cell organisms were found in the area, which indicate the emergence of life occurred a billion years earlier than previously thought. Also known as the “Genesis of Life”, this greenstone belt contains fossils of the earliest life forms on Earth as well as evidence of an ancient meteorite strike. Gold was discovered in the area over 120 years ago, marking the beginning of industrial development in South Africa, and the mines that flourished then are still producing the oldest gold on the planet. Christianson, who describes Barberton as a bowl of crumpled hills dressed in flat-crowned thorn trees and dusted with aloes and daises, says gold laid the foundations of the town. Evidence of the early gold rush can be seen at numerous sites, including Bray’s Golden Quarry, which was once a source of a rich ore deposit, and at Rimers Creek, where the Barbers struck gold. Sheba Mine, said to be the oldest operating gold mine in the world, is tucked away in a hillside, while Fairview Mine has the only biox plant in South Africa for the extraction of gold, and still operates a ropeway for conveying ore to the crusher. However, gold is not the town’s only treasure – the area’s botanical riches are a draw card for those seeking green gold. 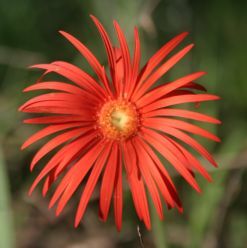 The biodiversity of the Barberton Centre of Endemism is said to be rivalled only by the Cape Floral Kingdom. “Cynics say this is simply because there have been more botanists in this area than elsewhere – and perhaps there is a fragment of truth there – but the botanists came because of the plants. The reason for the rich variety of plants is the area’s exceptional geology,” said Christianson. The Makhonjwa Mountains which surround Barberton – from Jeppe’s Reef to Oshoek and all the hills between, from Shiyalongubo to Queen’s River and Jambila to Songimvelo and Elukwatini – also have important high-rainfall catchments that are protected in terms of several proclaimed nature reserves. The area is also home to an abundance of wildlife, and walking through the town one can catch sight of the elusive Narina trogon, flashes of crimson from the wing of the purple turaco – and even baboons. The cultural history of the region is also significant, encompassing the colonial and apartheid eras, as well as that of the Swazi nation. Today, Barberton is home to many cultural groups that have played a role in shaping the town’s heritage. Christianson says, “On the darker side, Barberton has played a role in three great wars: the Anglo-Boer war and the two World Wars. Barberton Prison, made famous through Bryce Courtenay’s novel The Power of One, housed many a freedom fighter in the apartheid years, among them Helen Hendricks, Dorothy Dlamini, Dorothy Kubheka, Jean Middleton and Esther Barsel. Heritage walks through the town, which include visits to restored late Victorian residences, offer a peek into life during the 1880s mining boom. The local museum is housed in the renovated Barberton Iron and Steel Foundry building. Adjacent to the museum is the Umjindi Jewellery Project, which trains young people in jewellery design and manufacture. It also has a coffee shop and an interesting collection of arts and crafts. East of the town, on the old wagon road, is world-renowned Outsider artist Nucain Mabuza’s Stone Garden. Author Sir Percy Fitzpatrick and his dog Jock travelled this route and the book Jock of the Bushveld was written in Barberton. 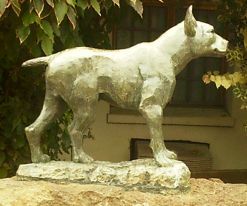 A chunky sculpture of Jock, created by Ivan Mitford Barberton – a descendant of the town’s founding brothers – stands outside the town hall.